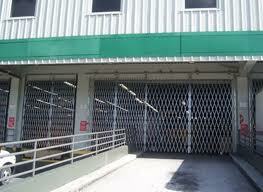 Commercial Loading Dock And Warehouse Metal Folding Security Door Gates. Heavy-Duty Folding Security Gates Made with Galvanized Steel. Folding Security Gates are your number one solution for theft prevention. Our gates are 100% made in the USA and provide a ventilated, safer and more secure location with folding security gates for doors and windows from Tampa Bay Security Door Gates. Galvanized steel security folding gates are the strongest, durable folding gates you can purchase. Our metal scissor security gates are galvanized, rust resistant, stand up to weather, look better and last longer! Our galvanized coating bonds to steel 10 times stronger than paint. That means they’ll be virtually maintenance free. Most folding door gates are used in industrial & commercial applications to add extra security to glass windows or quarter off an area such as a loading dock or convention stairwells. These accordion gates are made of high grade steel with pivot bushings to assure maximum security and easy operation for a long durable service. 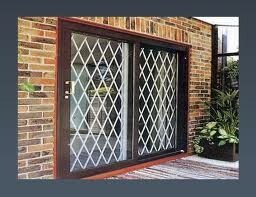 Tampa Bay Door gates offers heavy duty models for added security for high risk applications. Our gates come in just about any color. Scissor door gates can discourage theft just by their rugged appearance. Frequently used as storefront gates, they provide excellent retail window security by utilizing a track on top and bottom to assure highest after sundown security. During daytime hours the bottom track folds up out of the way at door entrances to provide a clear entry-way. These folding gates can often lower insurance premiums for businesses and provide an exceptional return on your investment. 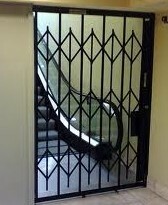 We offer custom installation on any of or steel folding gates! Just tell us what you need, and we’ll find a solution. Call us for a FREE Quote.